This I spotted on a shrub believe it or not in November looks like some alien tropical flower with a propeller as a stamen,I was told its name but forgot any of you lot reconise it Keith. One of my favourite aliens - a beautiful flower. 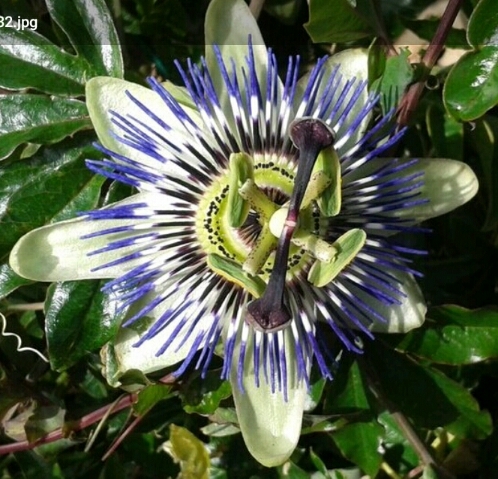 Passion Flower - Passiflora caerulea. Actually a vigorous climber which can also produce dense ground cover. I grow it in one of my greenhouses but it is reasonably hardy in the south of the UK. South American in origin. National flower of Paraguay. Certainly winters like this one won't harm it much. Somewhat invasive but fairly easily controllable.